The ten-year-old restaurant — prized in the neighborhood for its no-fuss coffee, Belgian waffles, and truly excellent chicken-curry sandwich (and recent location for a Taylor Swift commercial) — has closed its original location on Grove and Bleecker. It seems, once again, a rent spike is blame: this time said to be a dramatic increase from $16,000 to $42,000 a month. This is the latest in a string of independently owned, cherished establishments to close on Bleecker Street: August shuttered in June (and will reopen on the Upper East Side). Starbucks opened in the old Bleecker Street Records space. Manatus closed in April. And Bleecker Bob’s will become a sushi restaurant. Are you really sad that CAFE ANGELIQUE ON BLEECKER closed? Do not be sad! A roomier and potentially more charming space awaits you just a couple blocks down. Our staff is usually less surly. AND — anyone who mentions that they are visiting us because Cafe Angelique closed will get 50% off his/her first coffee or tea at Doma na rohu! Too soon, Doma. Too soon. 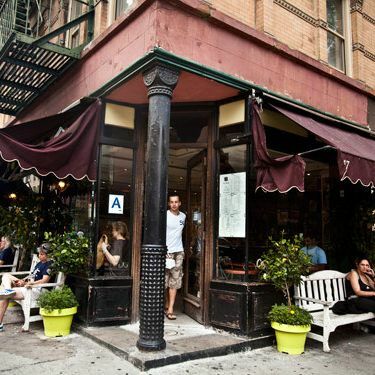 Fortunately, Café Angelique’s other location on Bleecker, near Lafayette, remains open.